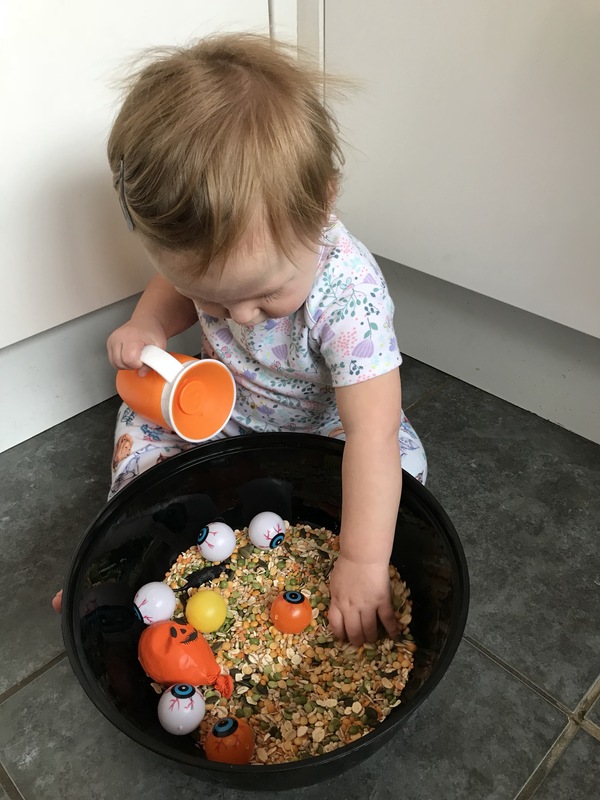 Halloween Messy Play! 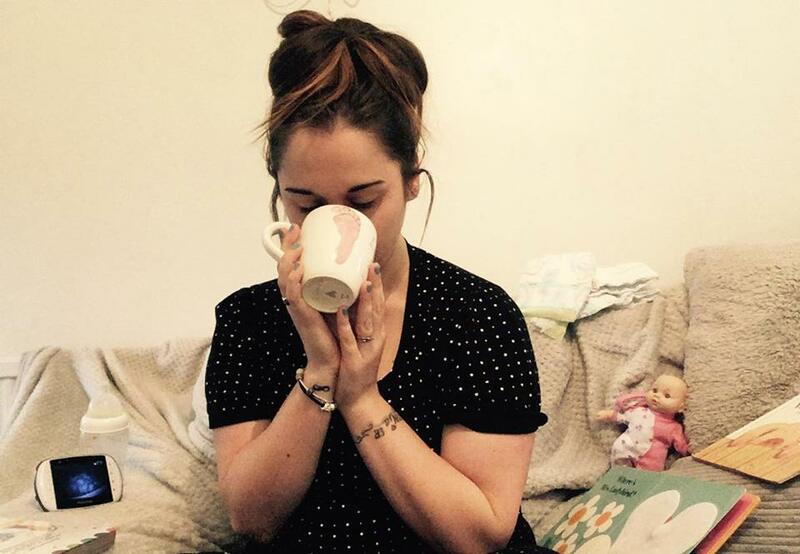 – But First, Tea. 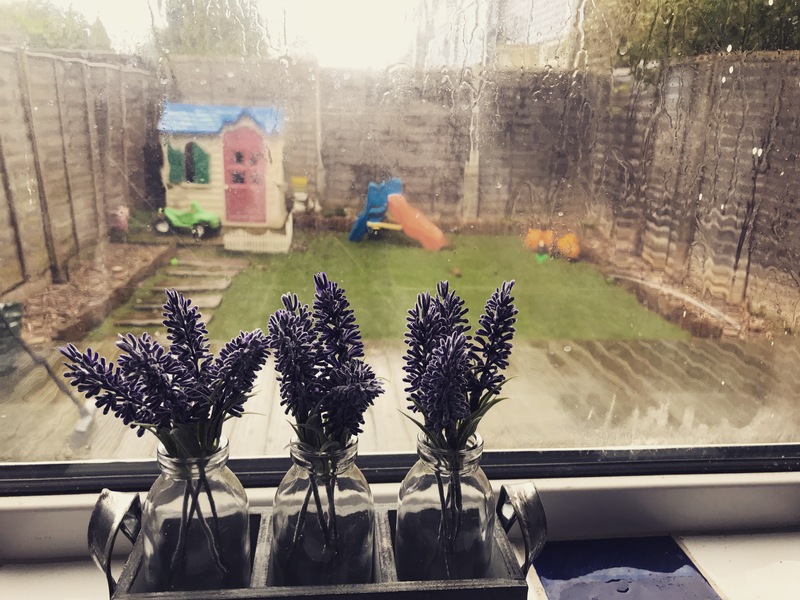 It’s raining, it’s pouring… and my toddler is going freakin’ nuts being stuck inside all day! We’ve recently been struck with crazy winds and non stop rain and whilst I’m always the advocate for getting outside whatever the weather, I reckon Edie might blow away. So, outside play was a no go and there’s only so much magic that Mr Tumble can provide! 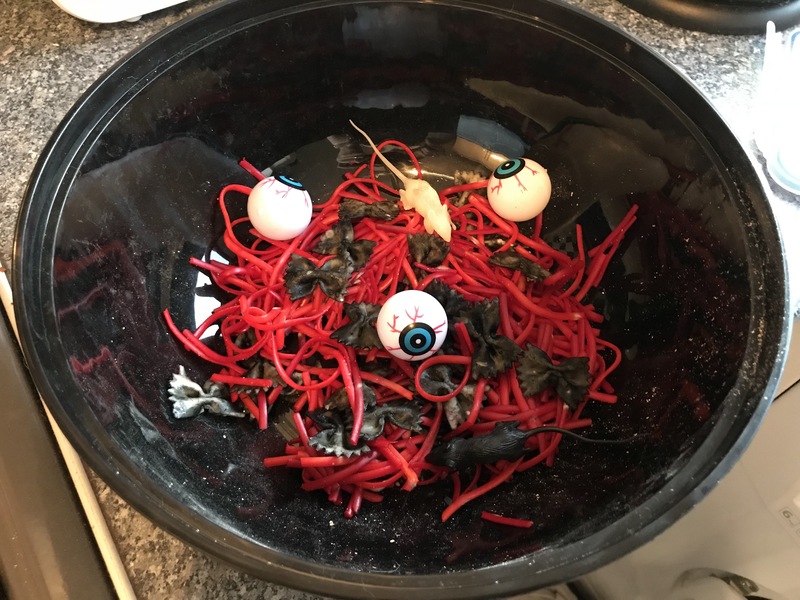 I thought I might as well put that teaching degree into practice and set up some Halloween sensory activities. 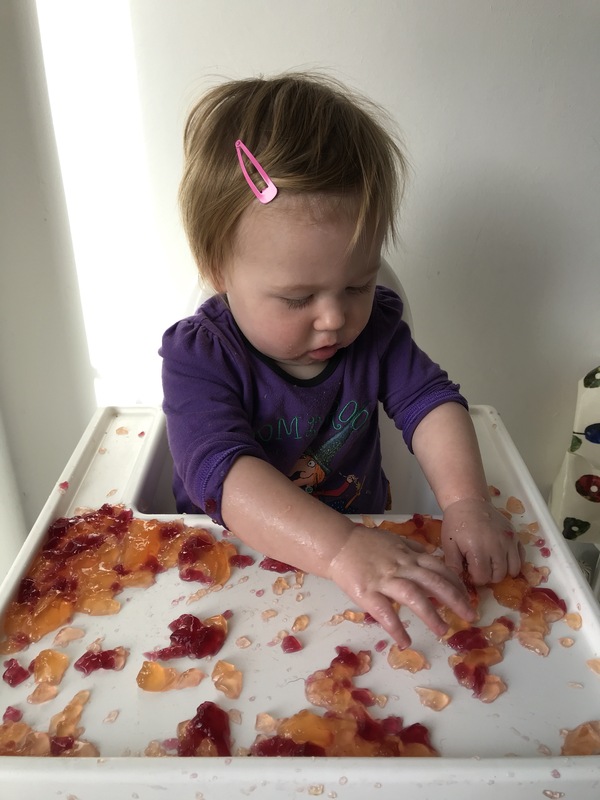 I know messy play makes some parents feel queasy, so there’s some non-mess ideas thrown in for you too! Nice easy one first. 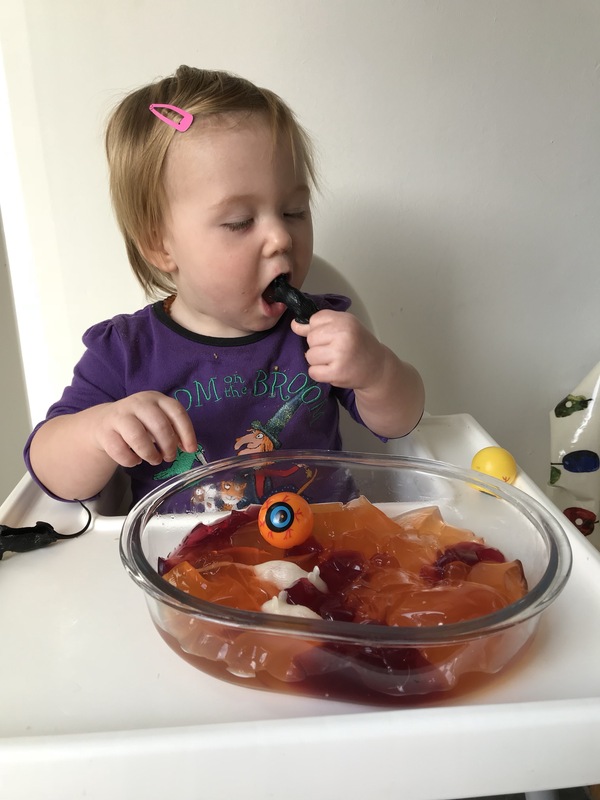 All you need is some jelly (we used the ready made pots that are always on offer!) Then chuck some toys in! 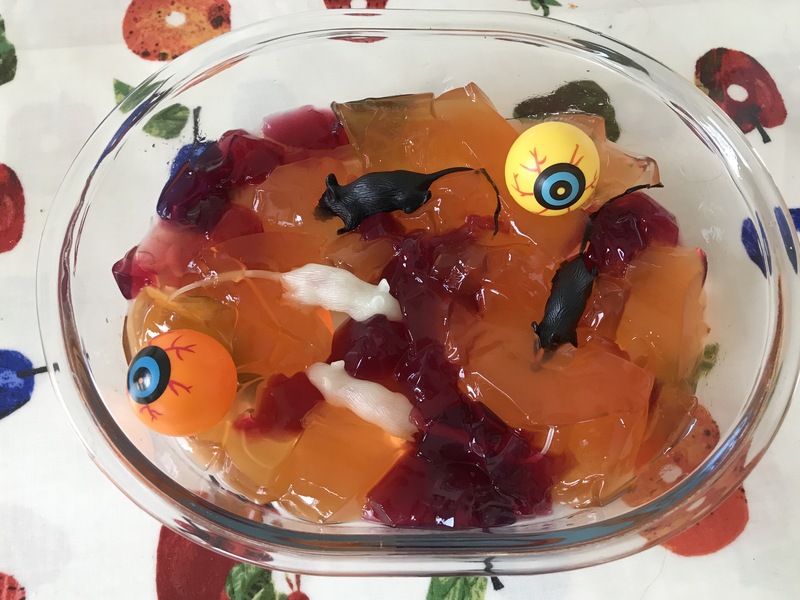 We went for googly eyes and rats for Halloween! Edie wasn’t sure at first, she didn’t really know what to do with it! Once she realised it tasted good… things changed slightly. 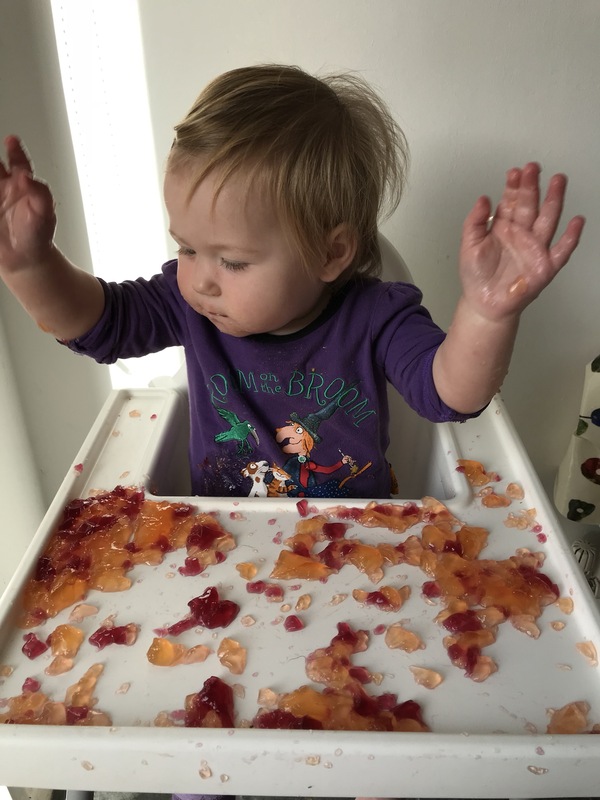 This one is mess free to play with, but requires a bit of prep. Oh, it also looks disgusting and sets my tryophobia off slightly. But anywhoo, it’s a sensory bag! 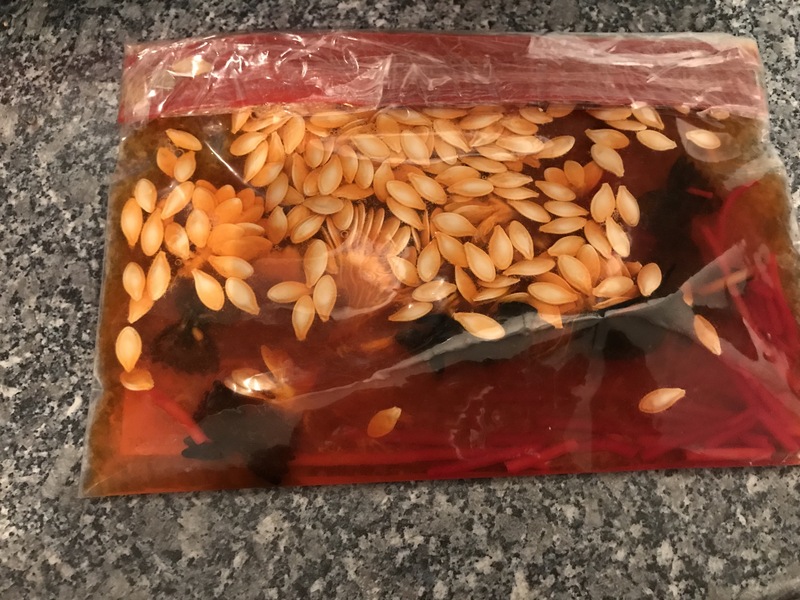 Fill a ziplock bag with water, hand sanitizer, food colouring and whatever else you fancy! 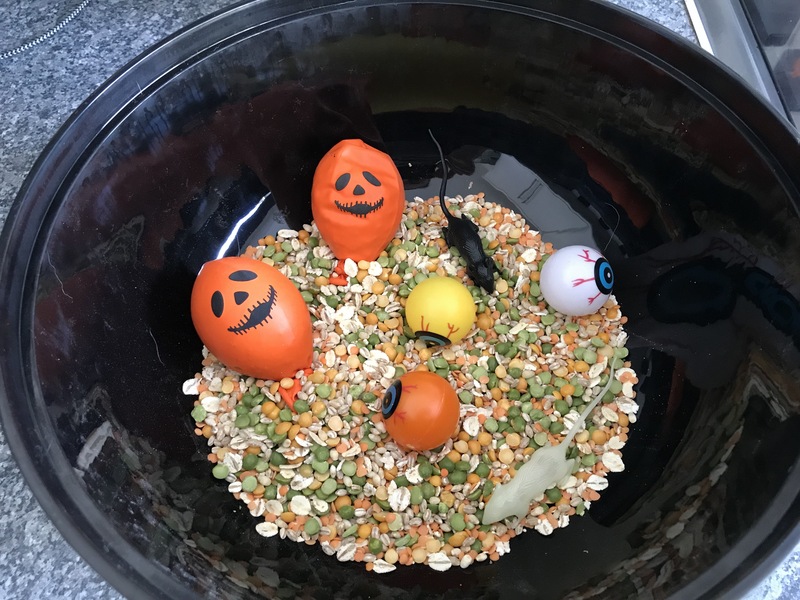 We’ve got some rats and spaghetti, alongside some pumpkin seeds (seemed like a shame to waste them!) Tape up the sides to stop any possible leaks and there ya go! A nice dry one next, with minimum prep! 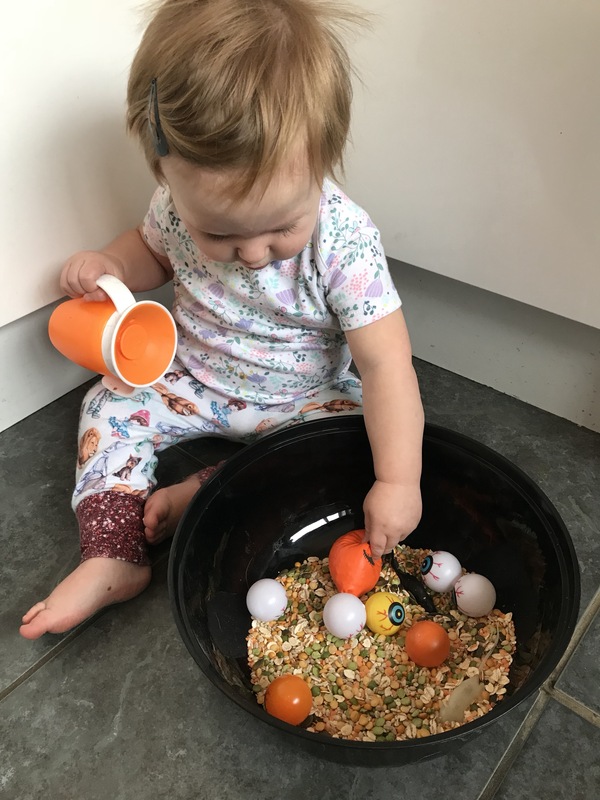 I filled a bucket up with beans, lentils and seeds, basically rubbish I had in the cupboard from when I was attempting to be healthy (ha) then, just chuck some toys in. Spoons and containers are great to put in. Also the balloons are filled with the beans! It’s like a baby stress ball, because we all know how tough life is being a toddler! I put some in a balloon and blew it up, Edie’s had great fun running round the house shaking it! This ones a gooden because all mess can be hoovered up really quickly. Wriggly blood worms and bats are always a winner! Nice and easy to make too! Boil some pasta until partially cooked, chuck in a sandwich bag with some food colouring, pour onto kitchen roll and set aside to dry out. 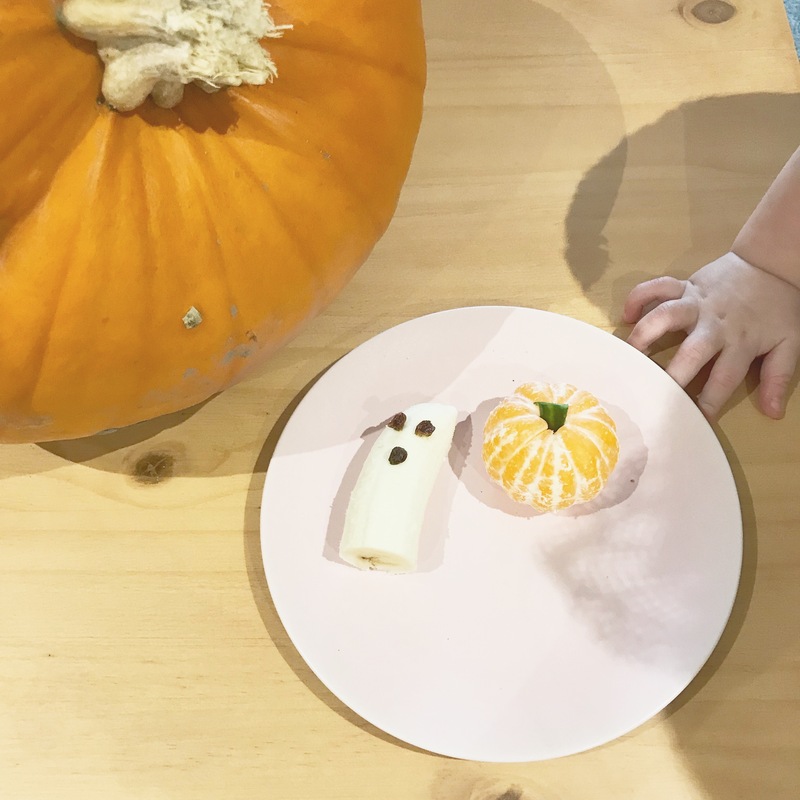 And if you’re feeling peckish after all of that, how about a ghostly banana and pumpkin satsuma! 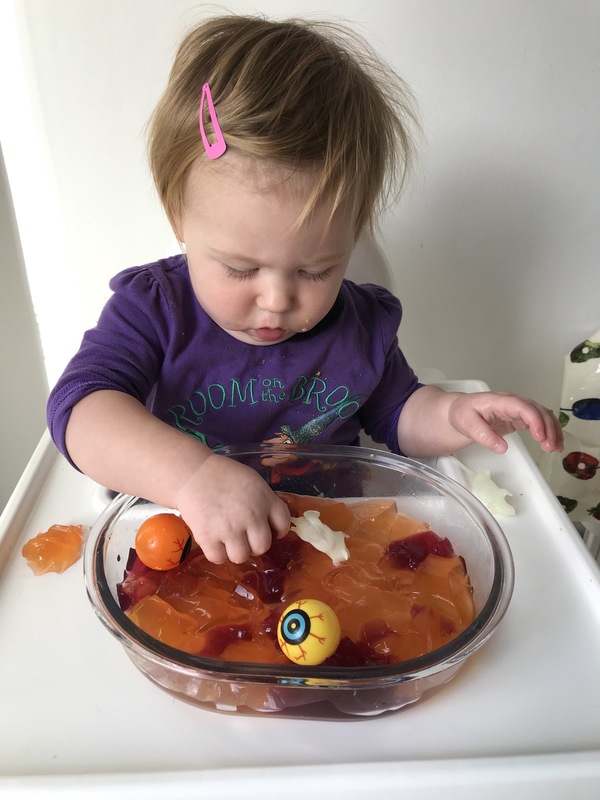 I love sensory play and Halloween! Such a fun idea! This looks great for developmental skills, plus it’s adorable. Thanks for sharing.